3D Printing is the "Next Big Thing", which will change our view on how we understand and interact with all kind of objects in our world. 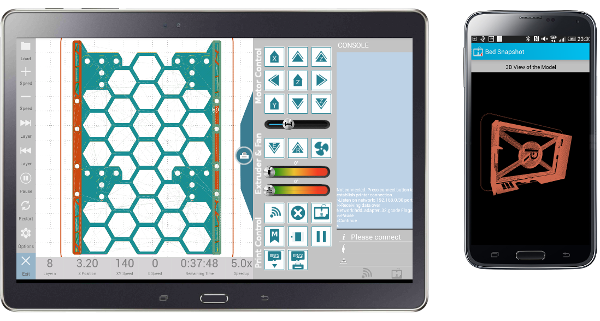 The GCode App Familiy brings the world of 3D printing right into your tablet/phone and allows you to simulate, print or analyze 3D files directly from your tablet on your 3D printer. The leading 3D printing App for Android devices. 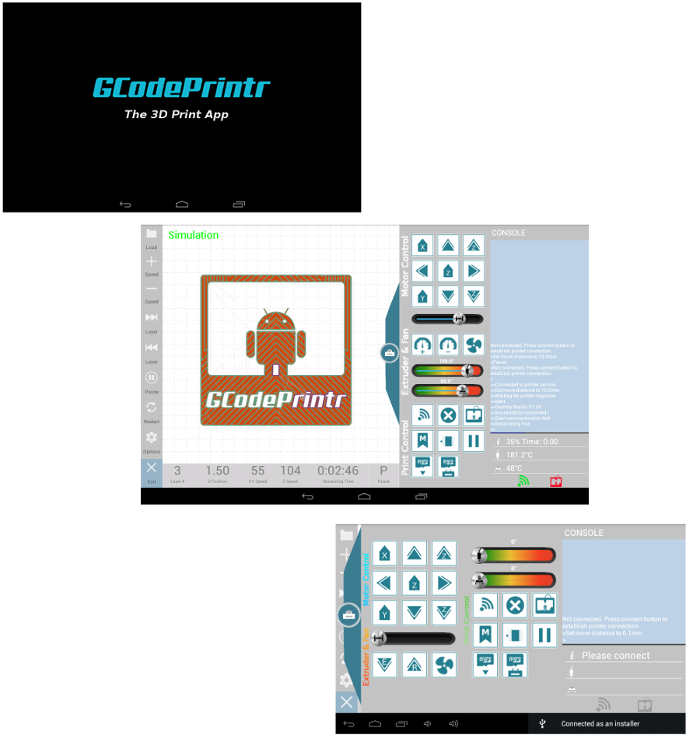 GCodePrintr for Android allows you to connect your favorite Android device to your 3D printer using USB-OTG cable. It provides printer control buttons to easily operate your 3D printer (XYZ Movement, Extruder, Heat,..) and supports full printing. Load your 3D model (gcode) into the App (from the Android devices internal storage, sd-card or even dropbox and gdrive) and print it directly without the need for a PC. Show details like estimated time, speeds, filament usage, cost,.. Easily modify speed during print and see how it impacts the print time. 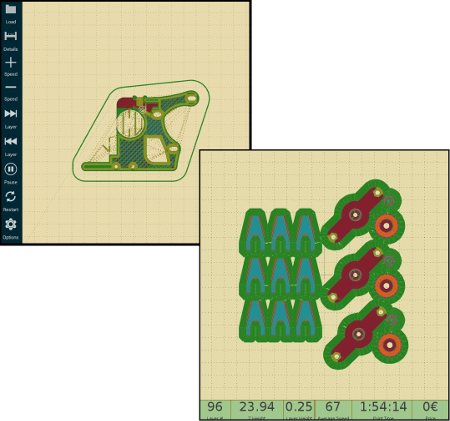 This application visualizes Gcodes and simulates a 3D print. 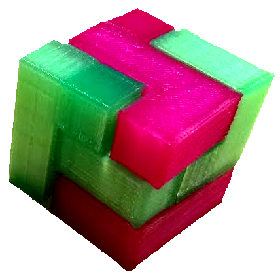 GCode is a programming language which tells 3D printers (and others) how to make a model. GCode Simulator recognizes the movements and print speeds and can simulate the print in realtime, but you can also speed-up the prints (fast forward). Each layer is painted in a different colour to see how a layer overlaps with the layer below. 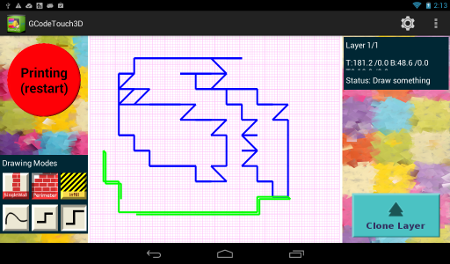 In addition to the top level view it also renders a front and side view of the object. 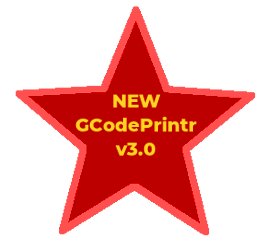 GCodeInfo analyzes 3D print files (gcode) and shows details about 3D print. How long will it take to print the object ? What is the material cost of it ? How can I optimize the print time of my 3D Model (where is the time spend) ? Whats the average print speed by layer ? The App answers these questions and much more ! The code of the PC version is available on github and everyone can contribute. Currently I test mainly with my own sliced files and most of the time I use Slic3r. To get a better coverage for Gcodes genereated by other slicers, it would help alot if send me some samples. Thanks ! Why donate ? Because it helps keeping the project alive. If you like the project please consider to donate. I really like to get feedback from you about things you like or dislike. Join the GCodePrintr and GCodeSimulator Community to get news, discuss problems, request features.